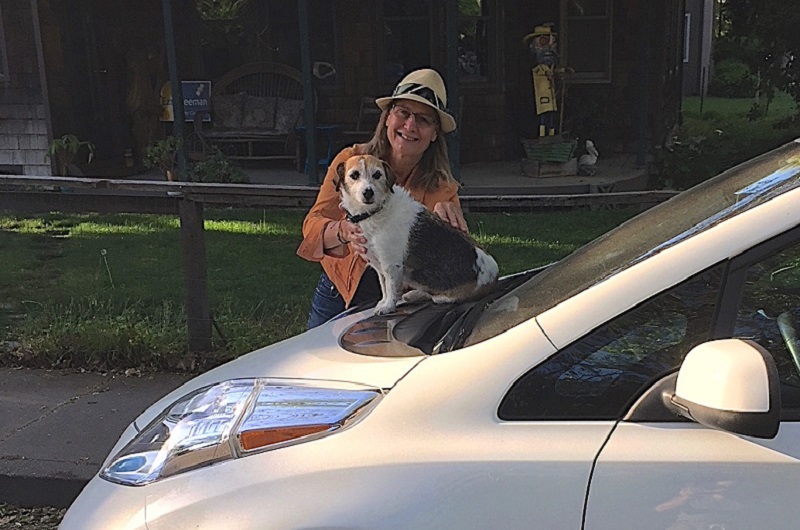 Besides enjoying how maintenance-free and fun to drive electric cars are, my partner Tom and I both try to be conscious about our impact on the environment. We divide our time between my home in Davis and his home in Vallejo, so we have the perfect opportunity to lower our carbon footprint. In addition, we now both have solar systems on our homes, so we also have the perfect opportunity to reduce the cost of commuting to near zero … a no-brainer! I lease my Leaf and the cost of the lease is the same or less than it would cost to lease a similar-sized gas vehicle and my charging with solar is free. (The Leaf also provides free charging at public stations for the first two years of the lease). Tom also has a hybrid/electric car: a 2017 Chevy Volt. He bought his Volt and after rebates it was a bit more expensive to purchase than a similar-sized gas vehicle. But there are almost no maintenance costs and free charging, so he expects to make up the difference. My daughter and newly arrived grandbaby now live in the Bay Area. Getting to Oakland and back in the Leaf requires charging at least once, so I need to schedule a half-hour extra into the trip. Most car trips are short, and for longer trips chargers are fairly abundant and at useful locations (the grocery store, the mall, etc. ), so it’s not as inconvenient to go fully electric as you might think. Tom’s hybrid Volt has a 50-mile electric range, and because most trips are short and within that range, he almost never uses the gas mode. Things will get even easier in the future: the emergence of 200+ mile-range electric vehicles will be game-changing! We’ve taken the Leaf on hiking excursions up the Sonoma Coast. And Tom’s Volt we take on longer trips. My dog Bella knows all of the interesting walks near the charging stations in the Bay Area. She’s especially fond of the trail along the creek behind Sprouts Market charging station in Pinole! What is the number-one thing you think could be done to encourage more people to go electric? Continue the rebates, add more chargers, and get the word out! 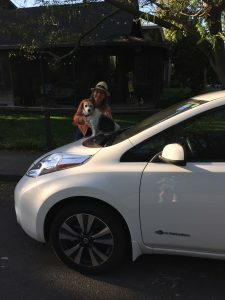 I’m thrilled with my choice to drive an electric car and happy to share my experience through this blog!